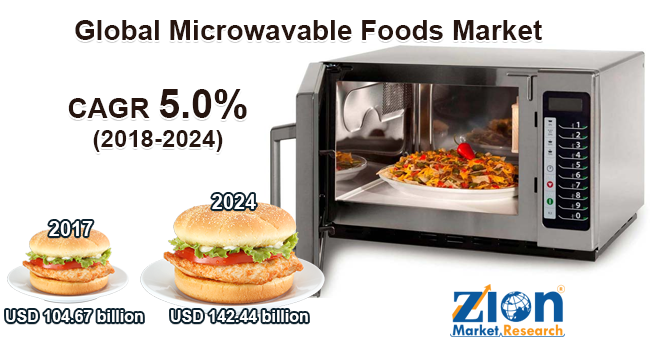 Zion Market Research has published a new report titled “Microwavable Foods Market By Type (Chilled Microwavable Foods, Shelf Stable Microwavable Foods, and Frozen Microwavable Foods): Global Industry Perspective, Comprehensive Analysis, and Forecast, 2017 – 2024”. According to the report, the global microwavable foods market was valued at around USD 104.67 billion in 2017 and is expected to reach approximately USD 142.44 billion by 2024, growing at a CAGR of around 5.0% between 2018 and 2024. A microwavable food requires less preparation time and it can be cooked by using a conventional microwave oven. Moreover, it comprises frozen, shelf–stable, and chilled meals such as vegetarian meals, beef, poultry, pork, soups, and frozen & chilled pizza. These microwavable foods are considered as nutritional foods, as it doesn’t involve any added fat.- Growing demand for convenient foods and easy to prepare& cook food are imperative factors driving the global microwavable foods market. In addition to this, rising number of working women and changes in the family dynamics lead to increasing dependency on ready-to-cook foods. Other key factors such as increasing disposable income, rapidly evolving lifestyle, and rapidly rising large retail chains are likely to support the growth of the market for microwavable foods during the forecast period. However, the growing concern of health among the population due to the shelf-stable, frozen, and chilled foods which contain less nutrition may hamper the global microwavable foods market within the forecast period. The global microwavable foods market is segmented on the basis of type, which includes chilled microwavable foods, shelf-stable microwavable foods, and frozen microwavable foods. Among them, frozen microwavable foods segment accounted for the largest market share. This growth is owing to the factors such as frozen method helps to store food for a very long time. Moreover, it also aids to retain nutritional properties in the food products, which are significant to synthesize a variety of minerals and vitamins in the body. Furthermore, to keep away from any spoliation and to preserve its nutritional properties to uphold profitability and competitiveness among food manufacture, the frozen technique is adopted by many food manufacturers. Besides, the rise in research and development activity by many microwavable food manufacturers for the robust freezing technology and rise in the number of food outlets in developing countries are projected to attain more share value over the forecast period. By geography, the global microwavable foods market finds its market scope in Europe, North America, Latin America, Asia Pacific, and the Middle East & Africa. Among which, North America is the fastest growing region in the global microwavable foods market. The traditional culture of snacking, quick and easy meal preparation, and processed food consumption are likely to fuel the growth of the global market within the forecast period. The regional segmentation includes the current and forecast demand for North America, Europe, Asia Pacific, and Rest of World with its further bifurcation into major countries including the U.S., Germany, France, UK, China, Japan, India, and Brazil. The report also includes detailed profiles of key players such as Campbell Soup Company, Beech-Nut Nutrition Corporation, Kellogg Company, ConAgra Foods Inc., Kraft Foods Inc., McCain Foods, Pinnacle Foods Group LLC, Bellisio Foods Inc., General Mills Inc., and Nestle SA. The detailed description of players includes parameters such as company overview, financial overview, business strategies and recent developments of the company.